Alma Claude Burlton Cull (1880-1931). Watercolour signed and dated 1924. The dreadnought keeping the seas here is identified, verso, in handwriting which is familiar to collectors of Cull, and in either his writing or perhaps that of his agent in the Brook Street Gallery, as HMS TEMERAIRE, a Bellerophon class ship. Further examination of the watercolour shows that this is the battleship towards the end of the Great War, 1914-18, as by then the class had been much modified, top masts being cut down, control tops enlarged, searchlight towers added and enhanced, and additional bridge superstructure and sponsons built up. 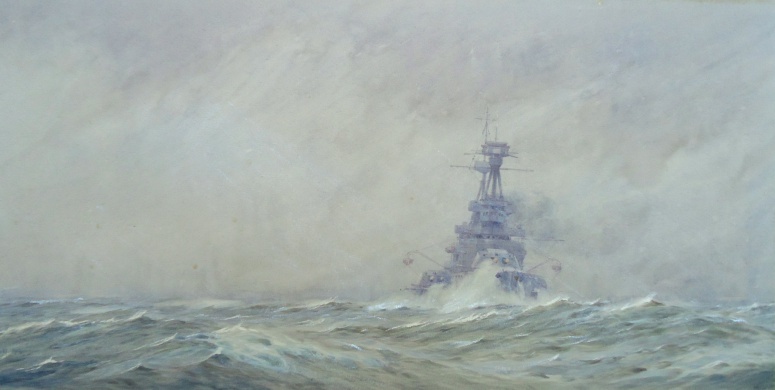 Commissioned in May 1912, TEMERAIRE and her 12 inch gun sisters had been in the line at Jutland and most of the other major actions of the war and had spent a huge amount of time out at sea patrolling, watching, waiting in weather so often like this: waiting for the opposition to show up. Scapa Flow in the windswept Orkneys was their base and quite often conditions there were little better than out at sea with ferocious winds requiring the ships to have steam up just to hold their anchors and avoid dragging. This in turn required steaming watches down below to be closed up in boiler and engine rooms as well as bridge watchkeepers and a focsle party to be instantly available to veer more cable or let go a second anchor. There was little rest! By the time of this painting TEMERAIRE and her sisters of the Bellerophon and St Vincent classes had been relegated to the second eleven: they were becoming obsolescent and a trifle worn, the years of demanding war service with inadequate time allowed for maintenenace making them old beyond their years. But in October 1918 as the High Seas Fleet was collapsing and with the threat from across the North Sea reducing commensurately, she went out to join the Eastern Mediterranean Squadron and with her sister HMS SUPERB (flagship of Vice Admiral Gough-Calthorpe) was present in Constantinople for the armistice negotations with Turkey. Returned to British waters in 1919 she re-commissioned under Captain L A B Donaldson CMG RN as a cadet and gunnery training ship and she was kept busy in this role for two more years before the Washington Naval Treaty and massive naval cuts following the end of the war inevitably led to the older classes of capital ships being paid off. HMS TEMERAIRE was scrapped in 1922. These ships – the like of which we will never see again – were undeniably impressive and no more so than when seen on a filthy day and in a large sea like this; and no one captures it better than Cull!